Peel, cut and cook the potatoes in salted water. Then drain and mash them with the egg yolk, flour, milk, baking powder and salt. Mix until you get a smooth dough. Place the dough on a floured surface and roll it out with a rolling pin. Once rolled out, cut 4 rectangles that are 20 x 8 cm. Place 2 bacon rashers vertically on a chopping board spaced apart. 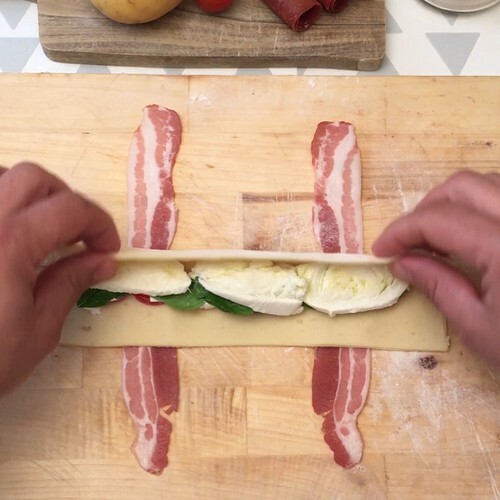 Place the first dough rectangle horizontally across the bacon, and place into the middle of the dough thin slices of cherry tomato and a layer of ricotta. Add a few basil leaves, sliced mozzarella and a drizzle of olive oil. Close the dough together and roll the bacon up around it, and fold it together to form a ring. Repeat the process to form 4 donuts. Fry the donuts in hot oil until they have a nice golden colour. Drain them on some kitchen paper to remove the excess oil, then enjoy hot.